Each day another friendly bee is placed around the beehive to help count the first 100 days of school. 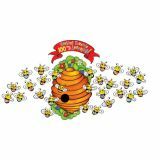 Set also includes 100 pre-numbered bees, 10 large bee cut-outs and a "100 Days of Learning" header. 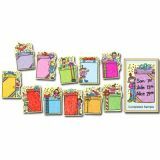 This mini bulletin board set and more includes: reproducible badge and bookmark patterns; 12 cakes, each approx. 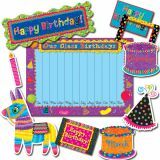 10 inches x 3.5 inches; 32 candles; 2 balloons; and a resource guide. 47 pieces. 36 hats per package with notched ends to adjust sizing. 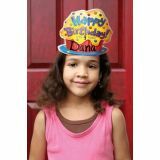 Personalize with child's age. 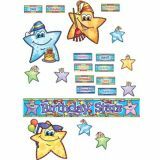 Features a 32" x 5" "Birthday Stars" banner, four seasonal stars, 30 birthday stars for student names, and 12 birthday month labels. Includes a four-page teacher guide with reproducibles. 48 pieces. 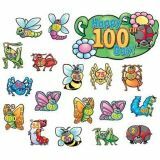 Set includes 10 each of 10 different kinds of bugs and a "Happy 100th Day" sign. Also includes a four-page teacher guide with reproducibles. 101 pieces. 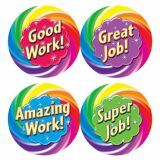 Perfect for rewarding good work or other special occasions! 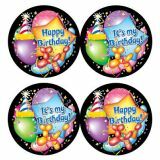 Each self-adhesive badge is 2 3/8". 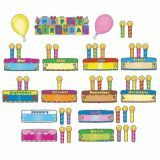 32 per package in 4 designs. 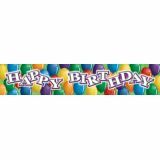 Perfect for rewarding good work or other special occasions! 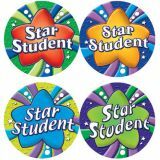 Each self-adhesive badge is 2 3/8". 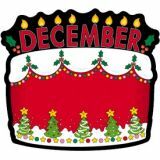 32 per package in 4 colors.